Mexico City has taken the top spot as the city with the most traffic congestion, according to a new report. Drivers in the Mexican capital can expect to spend on average, 59% extra travel time stuck in traffic anytime of the day, and up to 103% in the evening peak periods versus a free flow, or uncongested, situation — adding-up to 219** hours of extra travel time per year, per the results of the TomTom Traffic Index 2016 released by TomTom (TOM2). 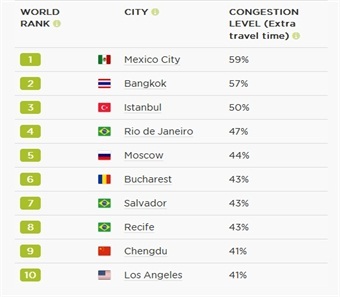 Next in the rankings are Bangkok (57%), Istanbul (50%), Rio de Janeiro (47%), and Moscow (44%), making up the top five most congested cities in the world. Using data from 2015, the Traffic Index looks at the traffic congestion situation in 295 cities in 38 countries on six continents — from Rome to Rio, Singapore to San Francisco. TomTom works with 14 trillion data points that have been accumulated over eight years. Looking at the company’s historical data, it’s clear that traffic congestion is up by 13% globally since 2008. But, interestingly, there are shocking differences between continents. While North America’s traffic congestion has increased by 17%, Europe as has only increased by 2%. It could be suggested that this points to economic growth in North America, and Economic depression in the rest of Europe. This European figure could be heavily influenced by Southern European countries such as Italy (-7%) and Spain (-13%) where there has been a marked drop in traffic congestion in the past eight years. 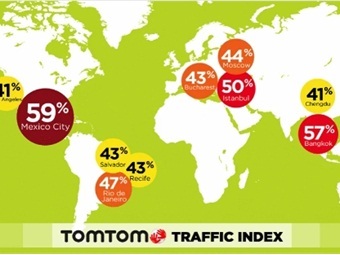 People can find out more about the TomTom Traffic Index, and discover where their home city ranks at www.tomtom.com/trafficindex. 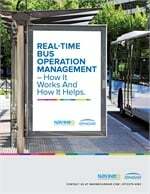 There’s also helpful advice on beating traffic congestion, as well as independent analysis. And, for the first time, a selection of ‘Profile Cities’ provide insight into what they are doing to improve mobility.